Homegrown Meats is a brand that launched in 2011, owned by a group of ranchers who've farmed the Palomar Mountain area of Southern California going back into the mid-1800s. They began marketing their steaks and cuts of beef to Whole Foods Markets shortly thereafter. In 2016, they launched a line of jerky, and Whole Foods Market picked it up only for their Southern California market. 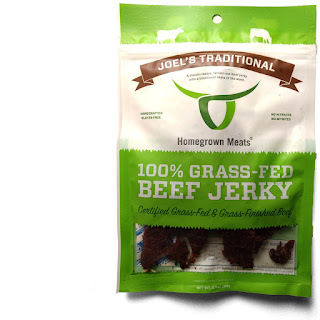 However, in October 2018, Whole Foods announced it would begin selling Homegrown Meats Jerky nationwide, with a four of the company's specialized flavors, "Joel's Traditional", "Cracked Black Pepper", "Western Mesquite Barbecue", and "Paleo". The jerky is marked as, "gluten free" and "certified grass fed". This "Joel's Traditional", according to Homegrown Meats, is described as, "a classic recipe named in honor of one of our original founders, Joel Mendenhall, who's family has been raising cattle on San Diego's Palomar Mountain since the 1800s", it goes on to say that it has a "traditional taste of the west". The first flavors I pick up on the tongue is a moderate sweet, followed by a light savory soy sauce. There's hints of smoke flavoring slowly creeping in and touches of garlic and onion. The chewing brings on a light tanginess as the soy sauce picks up definition slightly. The natural flavor of beef becomes noticeable in small amounts, while the black pepper finally starts making its move. Languishing in the background are hints of ginger and touches of cayenne. For being described as a "traditional taste of the west", it definitely takes on a flavor more traditional of modern times, particularly for its complexity of tanginess, sweet, savory sauce, spicy black pepper and cayenne, light levels of smoke flavoring. 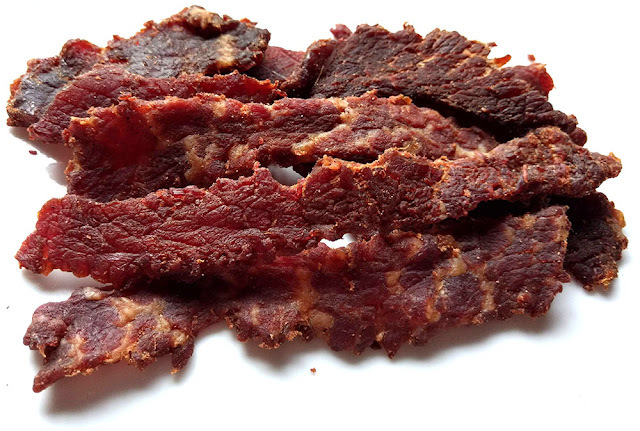 But yet, it does deliver in a fair amount of natural meat flavors, with a more marbleized profile, and is perhaps is comparable to what you might expect to find in the jerky of the 19th century. Otherwise, the primary taste profile is focused around a moderately defined soy sauce, but well sweetened, over a marbleized natural meat flavor, and then doctored up with a touch of tangy vinegar and citrus, garlic, onion, black pepper, and cayenne. Despite the addition of cayenne, it's not hot at all, and still rates a "mild" on our heat scale (level 1/5). The meat consistency looks to be slices of beef brisket, cut somewhat thin. Some pieces look lean, but others heavily fatted. Overall, it seems marbleized. The leaner slices start out chewy, and maybe a bit tough, yet chew down fairly easily once you get it going. The more marbleized slices are very tender and soft. Once chewed down, they take on a meaty, and almost steak-like feel. I do find some stringiness in these slices, however. This "Joe's Traditional" beef jerky from Homegrown Meats generates a lot of flavor, mostly through its complex blend of tamari sauce, vinegar, lemon juice, smoke flavor, brown sugar, and a variety of seasonings. While I wouldn't go so far as to say it has the "traditional taste of the west", it definitely has the traditional taste of modern Southern California, and would compete well against other west coast favorites found in trendy food stores like Trader Joe's, Sprouts, Baron's, and Cost Plus World Market. Certainly Whole Foods Market has a solid offering with Homegrown Meats. 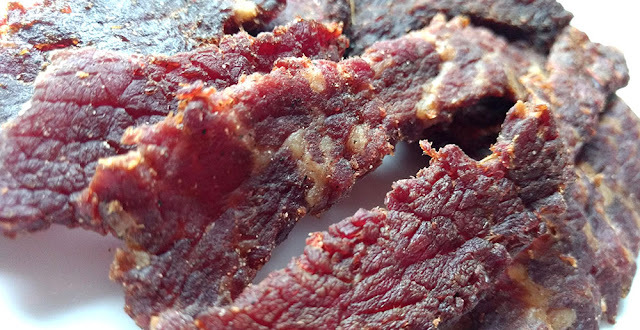 What I really like with this jerky is the marbleized cuts, and I wish Homegrown Meats puts more emphasis on delivering more consistency than the mixture of ultra-lean and ultra-fatty. You get some really amazing natural beef flavor through the more well-balanced cuts.